Adin Ballou (1803-1890), the founder of the Hopedale utopian community, was a pioneering theorist of nonviolence, a socialist, and an abolitionist. The Hopedale Community (1841-1856) was based upon "Christian Non-Resistance," a form of nonviolence using non-injurious force, and "Practical Christian Socialism," a form of socialism that, unlike Marxism, included private property and the profit motive. Unlike many other abolitionist peace advocates of his time, Ballou did not abandon his nonviolent principles during the Civil War. In later life Ballou trusted that his ideas would be taken up again, perhaps a century or more in the future. Perhaps the time is approaching when we will be ready to seriously consider Ballou's ideas on how we can effect change without harming others and thus live together in loving peace and cooperation. Friends of Adin Ballou honors the life and legacy of Rev. 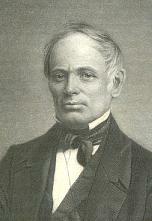 Adin Ballou, founder of the utopian community at Hopedale, Massachusetts. Ballou was a minister and theologian, a tireless reformer, and a leading nineteenth-century exponent of pacifism. The goals of Friends of Adin Ballou are to research and study the words and deeds of Adin Ballou and the Hopedale Community, and to find ways to keep their legacy alive in the modern world. "Adin Ballou and the Hopedale Community are still fighting slavery alongside Frederick Douglass"
"Ballou may be considered a major early theorist of nonviolence"
Adin Ballou is a truly revolutionary figure, deserving of serious public and scholarly attention. I want to focus on his achievement as a theorist of nonviolence: how his life and writings contributed to a clarification of language and thought in the long effort to find the most suitable name for the concept often called nonviolence. The limitation, linguistically, of the term “nonviolence” is obvious. It is rather like saying “non-hate” when we mean “love.” Linguists tell us that the brain is likely to register “violence” first, without the qualifier. In an effort to be clear about what we mean, I offer this working definition: Nonviolence: a philosophy or method or strategy associated with resisting injustice and humiliation, resolving or transforming conflict, and bringing about social change without killing or harming people. Ballou may be considered a major early theorist of nonviolence. In his book, Christian Non-Resistance, he makes every effort to be precise about what he means by “nonresistance,” and provides numerous examples of nonviolence in action. He explains what it is and what it is not, describing instances of people waging conflict and transforming conflict nonviolently. He suggested that nonviolence involves not just belief, but action. As with later theorists, he regarded it is as a force, a political reality. "... one would have thought Ballou's work would have been well known ..."
For fifty years Ballou wrote and published books dealing principally with the question of non-resistance to evil by force. In these works, which are distinguished by the clearness of their thought and eloquence of exposition, the question is looked at from every possible side, and the binding nature of this command on every Christian who acknowledges the Bible as the revelation of God is firmly established. All the ordinary objections to the doctrine of non-resistance from the Old and New Testaments are brought forward, such as the expulsion of the money-changers from the Temple, and so on, and arguments follow in disproof of them all. The practical reasonableness of this rule of conduct is shown independently of Scripture, and all the objections ordinarily made against its practicability are stated and refuted. Thus one chapter in a book of his treats of non-resistance in exceptional cases, and he owns in this connection that if there were cases in which the rule of non-resistance were impossible of application, it would prove that the law was not universally authoritative. Quoting these cases, he shows that it is precisely in them that the application of the rule is both necessary and reasonable. There is no aspect of the question, either on his side on his opponents', which he has not followed up in his writings. I mention all this to show the unmistakeable interest which such works ought to have for men who make a profession of Christianity, and because one would have thought Ballou's work would have been well known, and the ideas expressed by him would have been either accepted or refuted; but such has not been the case. "That greatest of American writers was--Adin Ballou!" [Tolstoy] expressed a liking for Emerson, Hawthorne, and Whittier, but he seemed to have read at random, not knowing at all some of the best things. He spoke with admiration of Theodore Parker's writings, and seemed interested in my reminiscences of Parker and of his acquaintance with Russian affairs. He also revered and admired the character and work of William Lloyd Garrison. He had read Longfellow somewhat, but was evidently uncertain regarding Lowell,--confusing him, apparently, with some other author ... On my attempting to draw from him some statement as to what part of American literature pleased him most, he said that he had read some publications of the New York and Brooklyn Society for Ethical Culture, and that he knew and liked the writings of Felix Adler. I then asked who, in the whole range of American literature, he thought the foremost. To this he made an answer which amazed me, as it would have astonished my countrymen. Indeed, did the eternal salvation of all our eighty millions depend upon some one of them guessing the person he named, we should all go to perdition together. That greatest of American writers was--Adin Ballou! Evidently, some of the philanthropic writings of that excellent Massachusetts country clergyman and religious communist had pleased him, and hence came the answer. The members were men and women drawn together by a common interest in the great principles of liberal and practical Christianity at a time when church doctrines were narrow. In addition to the vital principles of ultimate salvation for all, temperance, non-resistance, etc. each one brought some fad of his owna belief in Spiritualism, or the vegetable diet. Some were non-shavers, and all, I think, were non-smokers. The fads, which were almost as dear to the hearts of their owners as the principles, were often discussed in public, and the free play of the various natures, grave and gay, matter of fact and mischievously humorous, made these meetings a "continuous performance" of vast entertainment. The argument was earnest on either side, and usually closed by each with the same emphatic utterance, "So it seems to me and I cannot see it otherwise!" Neither party convinced the other, but the war of words afforded a certain relief to strenuous natures who, as good-non-resistants could indulge in no other form of warfare. The small band of vegetarians were firm in the faith and provided much amusement for those who had no scruples against a meat diet. A wag among the latter having discovered that Mr. Asaph Spaulding, one of the most voluble defenders of vegetarianism had fallen from grace by partaking of codfish charged him with it in open meeting. Mr. Spaulding being for once at a loss for words his wife came to the rescue, exclaiming, "Asaph wanted a codfish and I got him one." On another occasion a young man who wished to deal fairly by both sides of the question, remarked that one's occupation should be considered in the matter of diet, and that the performance of manual labor required meat. To shave or not to shave was a burning question. I remember a non-shaver who, having worked his fiery way to the climax exclaimed, "I have not shaved for five years, and I will never shave again!" Instantly the quiet voice of Mr. Swasey answered, "You may get shaved though."